Since I’m named after my grandmother, this seemed like the time to write about her (this week’s prompt is “same name”). Besides my name, I got my coloring from my grandmother, and my crocheting ability. (If there’s anything else, someone tell me, because I can’t see it!) Almost everyone who knew my grandmother called her Miss Annie, even some of her grandchildren. Our family called her MaMa (even accent on both syllables), but with all the genealogy work I’ve been doing, I’ve gotten in the habit of calling her Miss Annie, too. 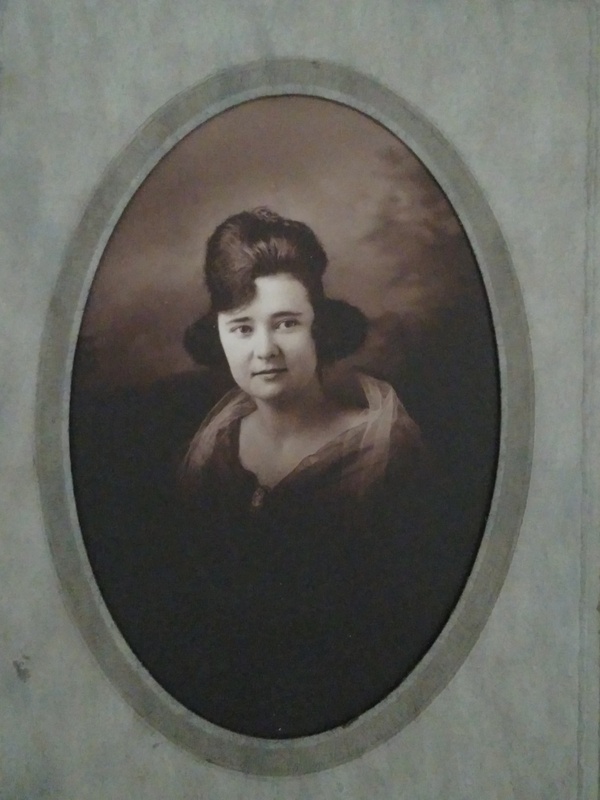 My maternal grandmother was born on 13 August 1902 in Rockingham, North Carolina, the second child and eldest daughter of Neil Henry Reynolds (1879-1920) and Mary Penelope Phifer (1880-1955). 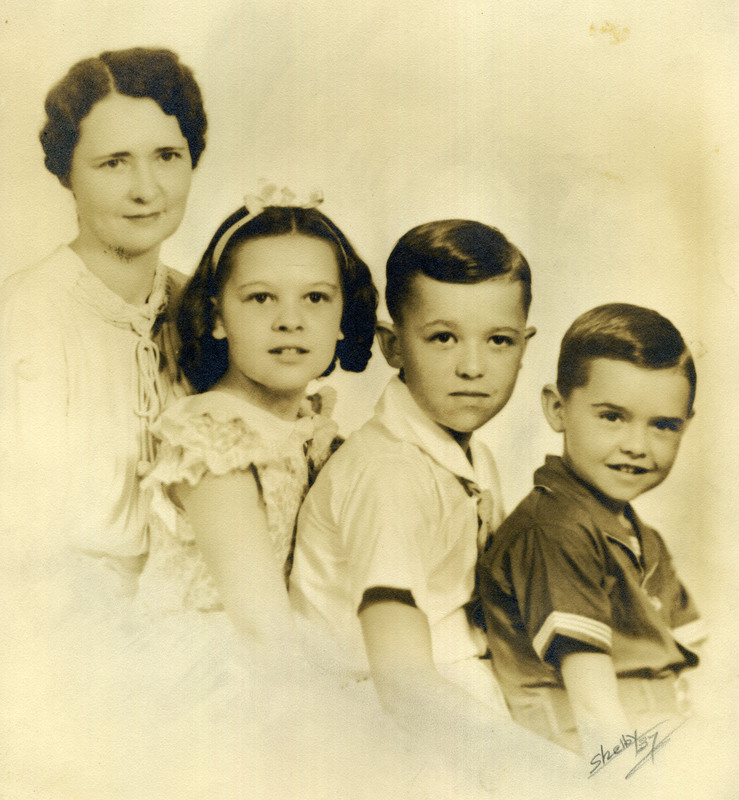 She had four brothers and a sister: Eugene Stancil Reynolds (1899-1950), Pearl Cleo Reynolds (1905-1983), Earl Osborne Reynolds (1908-1967), Tracy Odell Reynolds (1910-1952), and Neil Henry Reynolds, Jr. (1911-1913). Young Neil’s death at the age of two was a huge emotional hit on the family. Annie Jeanette Reynolds as a young woman. Miss Annie’s father was a salesman at a grocery store, which, more than likely, was associated with one of the mills in the area. By the 1920 census, when Miss Annie was 18 years old, Neil did not declare an occupation. It’s possible he was already suffering from what would kill him just a month after the census taker came to the house: influenza pneumonia. Miss Annie had gone to Raleigh to a business school, but dropped out because the family could no longer afford to pay for her tuition. She got a job as a clerk in a dry goods store. On the first day of July in 1923 Miss Annie and Ledbetter McKenzie (1902-1970) were planning to marry at the Methodist Church. All the guests were there and the bridal party was waiting outside for the happy couple. Not long before the big event was to begin, Miss Annie and Ledbetter, along with their friends C. R. White and Mary Hamer (who eventually married each other), drove by the church and waved on their way to Bennettsville, South Carolina, where the two were married by a Justice of the Peace. My grandfather (PaPa) didn’t want to get up in front of all those people. Miss Annie’s parents were not pleased! Come to find out, PaPa was pretty spoiled. The only vegetables he would eat were boiled potatoes and green peas. Well, Miss Annie got tired of fixing that, so she decided to fix what she wanted and if he was hungry enough he would eat it. He probably whined a lot, but she prevailed. By the time I came along, he’d eat pretty much anything she put in front of him. When Ledbetter’s father died in 1924, his mother, Lula O’Brien McKenzie (1870-1948), came to live with him. If nothing else, this gave Miss Annie some live-in help with the children: Malcolm (1925-2008) was first and my mother, Betty (1927-2015) followed; Benton (1929-2014) was the youngest. 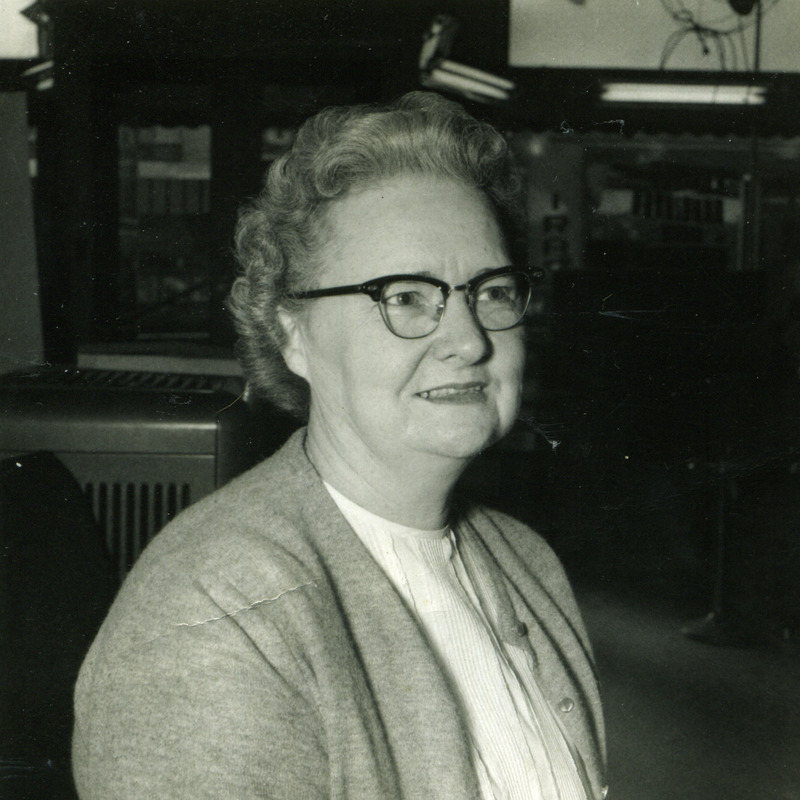 They lived in Cordova, a little mill community outside of Rockingham, and Ledbetter worked for the mill grocery store. By 1940 both of them were sales people at a textile store (possibly connected to the mill). Miss Annie made lasting friends with the people who lived in their neighborhood. Mother loved to chew bubble gum and see how big a bubble she could produce. One day she was driving along and blew a huge bubble that popped all over her face, but she kept on driving. Miss Annie at work at R.W. Goodman Co.
At some time after 1941, Miss Annie went to work for R. W. Goodman Co., a department store in Rockingham. Owned by Raymond Goodman, it was known for its furniture, but also sold other household goods as well as clothes. Before she settled into her bookkeeping duties, Miss Annie worked as a buyer. She took a trip to New York at least once; I’ve still got the souvenir she brought me—a whistling mug. When her son Malcolm got back from World War II, he helped his parents buy a house using his VA benefits. Her grandchildren all have fond memories of that house. The yard had a huge pine tree in the back with azaleas planted all around. Miss Annie had a green thumb; she could poke a bare stick in the sandy soil and it would root and grow. She mostly grew petunias—the pale-blossomed stringy ones—that I would pick for bouquets, getting their sticky stuff all over me. The house had a central stove that provided heat; they didn’t install forced-air heating until maybe the late 1950s. And the one window air conditioning unit in the kitchen didn’t go in until the 1960s after one of them had a health scare and the doctor insisted on the air conditioner. Ledbetter and Annie McKenzie in the house their son helped them purchase. Miss Annie would go to the beauty parlor to have her hair fixed. She wore it the same way for years. Between visits she’d usually undo whatever the stylist had done that was different, and it would look the same as always. She had a collection of really tiny permanent rollers, the old metal kind. When we visited, she’d let me play hairdresser with her, combing, rolling, combing some more. I doubt I was very gentle, but she was very patient. My grandmother was the one who taught me how to crochet. She started me on yarn, but eventually I decided I wanted to be able to make lace like she did. She could put out “mile-a-minute” lace (looks like ric rac) at about that rate of speed. She adorned curtains, pillowcases, and tabletops. 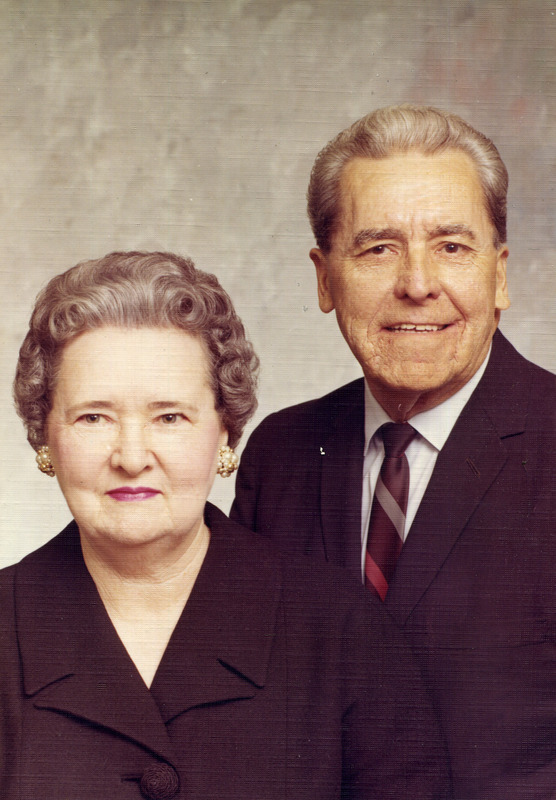 Church directory picture of Miss Annie and Ledbetter taken around 1967. Everyone’s favorite: Japanese Fruit Cake, a recipe she got out of the old Grit magazine. She freely gave out the recipe, but everyone said they just couldn’t get it to taste like hers. She made several each Christmas and gave them to her closest friends as gifts. The recipe calls for ground raisins and freshly ground coconut, which Miss Annie did with a hand-cranked food mill. At Miss Annie’s 75th birthday party at Whippoorwill Woods in Rockingham, with her three children, Malcolm, Betty, and Benton. The children grew up, went off to school, got married and had children of their own. 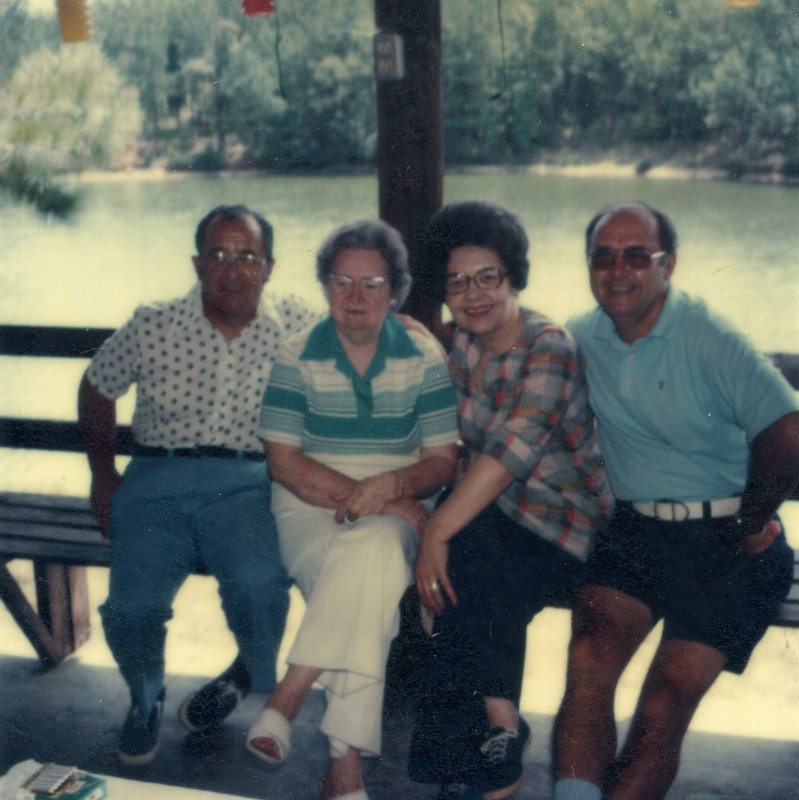 Sometimes Miss Annie and PaPa would come to Charlotte (two of her children lived there with their families) and sometimes we’d go to Rockingham. When Miss Annie turned 75, we had a party for her in Rockingham where both McKenzie and Reynolds kin folk got together to wish her a happy birthday. When we lived in Rockingham, we would visit MaMa at work. The office was a corner of the store, behind a counter where people paid for their purchases. She ran the bookkeeping machine and new everyone who came into the store, and they knew her. Raymond Goodman thought the world of Miss Annie, and when Ledbetter died (they were both 68 at the time) he told her to take as much time as she wanted and she’d have a job when she was ready. I’m not sure exactly how long it was, but she eventually went back to work. One of the women who worked in the office would pick her up and take her home. After about ten years, she decided that working was getting in the way of her social life, so she dropped back to part-time. A staged picture shows Miss Annie didn’t lose her sense of humor after her stroke. It was in the early 1980s when my mother got the call. Miss Annie’s co-worker, Linnie, had gone to pick her up and got no response to a knock on the door. She went in to see what was wrong. There was cereal with orange juice poured over it in the kitchen. Linnie found MaMa on the sofa in the living room, half-dressed, staring. Miss Annie had suffered a stroke. They took her to the local hospital for her initial evaluation and treatment. When she was released, she went to live with her daughter in Charlotte. MaMa did pretty well for a few years, able to get about in a walker at home or a wheel chair for an outing in the park. About a year before she died, she started going further downhill, and requiring more care than my parents could give her. The last few months of her life she was in a care facility in Hickory, North Carolina, where she died on 29 October 1987 at the age of 85. 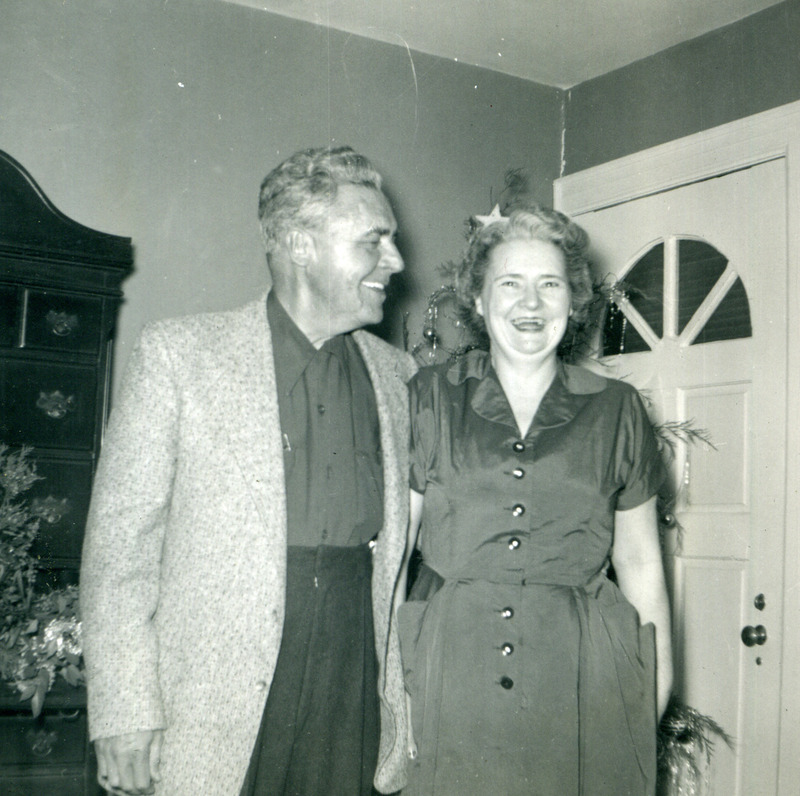 This entry was posted in 52Ancestors, McKenzie, O'Brien, Phifer, Reynolds. Bookmark the permalink. 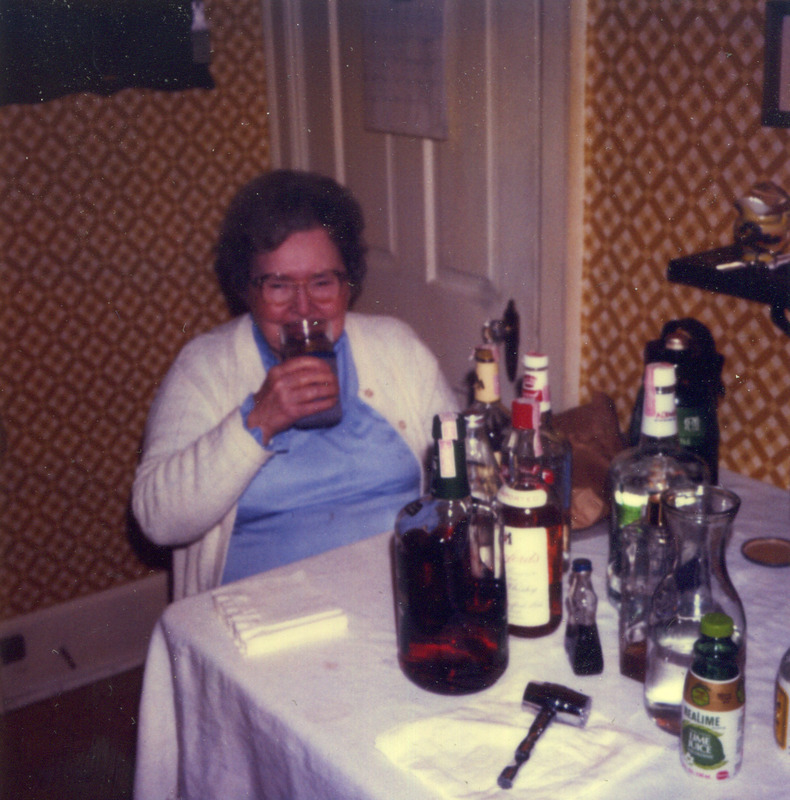 I feel like your grandmother and my grandmother could have been friends. I had a great time reading about your grandmother’s life. I loved reading about Miss Annie – it sounds like she was a special person.